Irene Metrick, a Breton woman who has a house in the northwest quadrant of the Imperial City Elven Gardens District, is the master trainer in Blunt. Irene is quite a mystery, and the advanced trainers make references to some horrific acts in her past. She sleeps from midnight to 6am in her house and will then wander around her house until 1pm. From Morndas to Fredas, between 1pm and 8pm she spends her time in the Market District. On Morndas, Middas and Fredas she patrols the covered area to the east; on Tirdas and Turdas she prefers the area to the northwest. From 8pm until midnight she returns to her house. She is supposed to eat between 6pm and 8pm but her wandering schedule takes precedence. 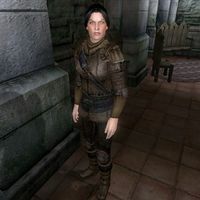 On the 25th of each month between midday and 5pm, as long as Bogrum Gro-Galash is still alive, she will visit the Black Horse Courier offices as part of the Unfinished Quest to do with Couriers. The exception to this schedule is during the Light the Dragonfires quest, when all residents of the Imperial City are under martial law and confined to their houses. After completing the master training quest, Irene will provide training at all times of the day, except when she is asleep. Irene wears a leather cuirass along with a pair of greaves and boots. She is armed with a steel dagger and also carries a quilted doublet, tan linens, her house key and a small amount of gold. Speaking to Irene will have her introduce herself by saying: "I'm Irene Metrick. If you needed to know more, you'd already know." Asking her about the Imperial City when her disposition toward you is at least 60 will have her suggest that you meet several residents of the city: "To know the right things, you have to know the right people. Ida Vlinorman, Mandil, Samuel Bantien, and Othrelos are the right people." Notably, these people are all fellow trainers. Citizens of the Imperial City can be heard talking about Irene's talents, although mistakenly thinking that she has acrobatic abilities (see notes). Some people can be heard asking: "Have you ever seen Irene Metrick move? Amazing." and "Isn't Irene Metrick graceful?" while others will respond by mentioning that she offers training: "She's something else. I've heard she'll train others, as well." and "She's impressive, and she'll train others." Other citizens can be heard discussing their observations of Irene: "I saw Irene Metrick recently. She jumped clear over a table at the inn." and "Irene Metrick moves with such grace. I wonder what it is she does." which may lead to others confirming these observations: "She jumps like a toad. She'll also teach others how to do it." and "She's pretty amazing. Plus, she teaches others how to do it." When asked about the Imperial City, Roderic Pierrane will mention his questionable relationship with Irene, claiming however that they are just friends: "Irene Metrick and I spend a lot of time together, true. We're just good friends. But don't tell Elisa. She wouldn't understand." Azzan and Christophe Marane, the two advanced trainers in Blunt, will send you to Irene should you ask them about master training. Azzan will direct you to the Imperial City while also mentioning how Irene used her skills: "I've heard tales of a woman who used a blunt weapon in horrible ways people had never seen. Irene Metrick, I think her name was. If she's not in prison, you might try searching the Imperial City for her. Maybe you can convince her to teach you what she knows." Christophe will provide a similar reference to the master trainer, although mentioning that she has since atoned for her dark past: "You want to do as much damage as possible with an axe or a hammer? Find Irene Metrick, and talk to her. The things she did.... Well, I heard she atoned for her crimes. She might be willing to train you, I suppose." If you ask them about training again, they will simply provide you with a quick reminder: "Look for Irene Metrick in the Imperial City. She can do some amazing things with a weapon in her hand." Asking Irene Metrick for Master Blunt training will have her laugh at you if you've yet to kill at least fifty people: "Training? From me? Ha ha, you must be joking! How many people have you killed in your lifetime, eh? Not as many as I, my little friend. When we're equals, you might interest me." Asking her for training again before completing her request that you kill at least fifty will have her claim that you're not worthy of training from her: "If you've killed fifty people, it's still not enough for my tastes, but I might reconsider at that point." Once you've completed her task and killed fifty people, she will agree to train you: "You've got quite a past, don't you? Left some bloody trails? You tell yourself they all deserved it, right? Ha, ha. With a body count like that on your head, you're my kind of person. You want training? Fine by me. Be sure and put it to good use." Blunt Training: A Master in blunt skills needs to know sufficient bloodthirst to receive her training. If you raise Metrick's Disposition to 60 and ask about the topic Imperial City, she'll identify four other trainers including advanced Sneak trainer Othrelos and advanced Security trainer Mandil. NPCs seem to confuse her with Ida Vlinorman and her acrobatic abilities, as the NPCs' rumors often state that Irene "moves with such grace" or that she "jumped clear across a table once". This issue has been addressed by the Unofficial Oblivion Patch; their dialogue has been altered.